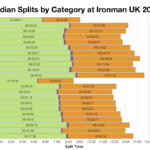 I spent a lot of Sunday afternoon repeatedly hitting refresh in a browser window, desperate for updates on my athletes at Ironman UK. 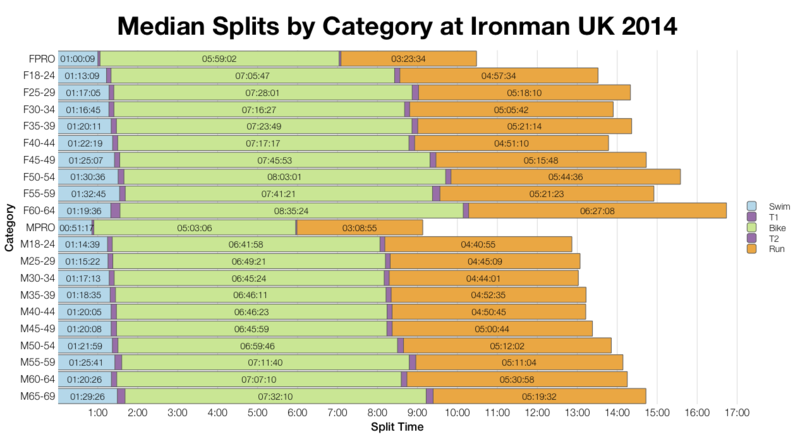 By early evening we had some good results: an age group win in the M35-39 category – not bad for an Ironman debut – and lots of solid performances with a few personal bests thrown in. On the flip side, later in the evening, it became clear we also had one DNF as an athlete was forced to drop out of the run. 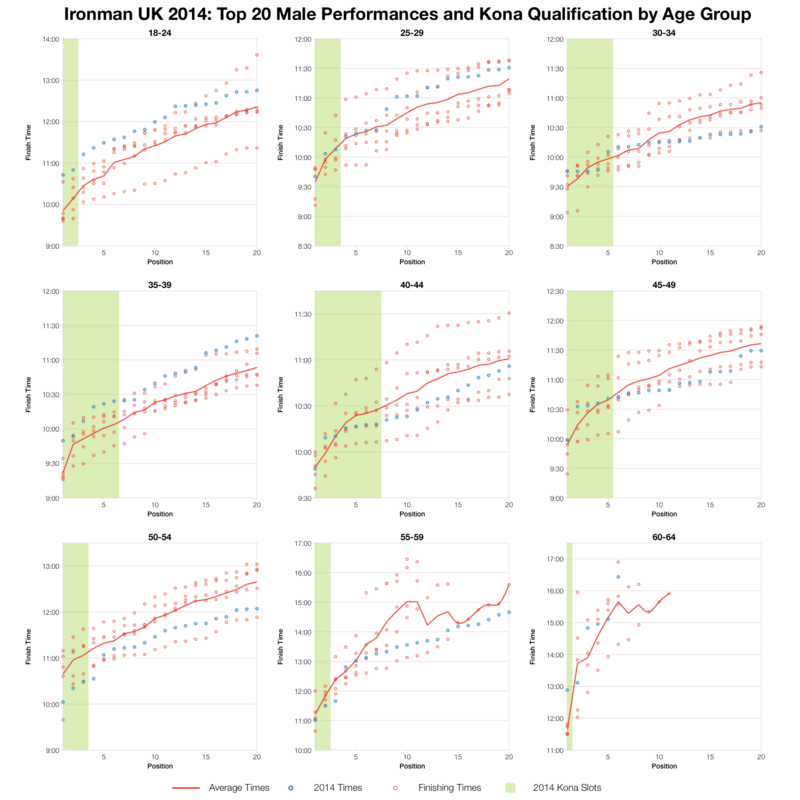 I’ll have plenty of race report and data to analyse in the next few days, but before all that I’ve taken a quick look at the race results to see how it compared to previous years in Bolton. There’s also a link to a spreadsheet of all the splits at the bottom of this post. The distributions give us a slightly more detailed picture. 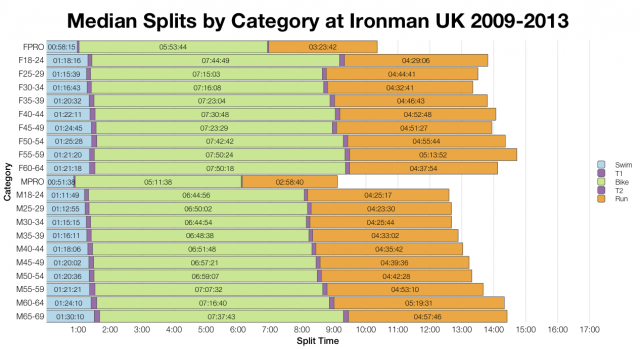 From this viewpoint the swim actually trends very slightly slower than previous years. 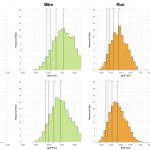 The bike has a lot of extra weight at the tail end of splits, but percentile times tend to fall inline with the past; the median here looks a touch faster while the front 5-10% times appear a little slower. The run has a much clearer right shift towards slower times that sweeps across the entire field. The net result is a similar shift in the finisher splits and a race at the slow end of Bolton results with a much lower percentage breaking 10 hours. 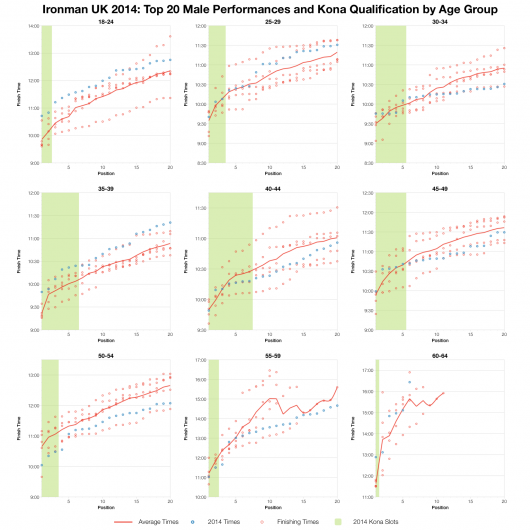 So when we look at the top twenty results in each age group as a general rule this year (in blue) falls around the average line. 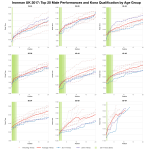 It’s not a clear picture, some age groups performed much better than others: F40-44 was particularly fast for example. On the other hand some, like the M18-24 category, were slower than we’ve seen before. 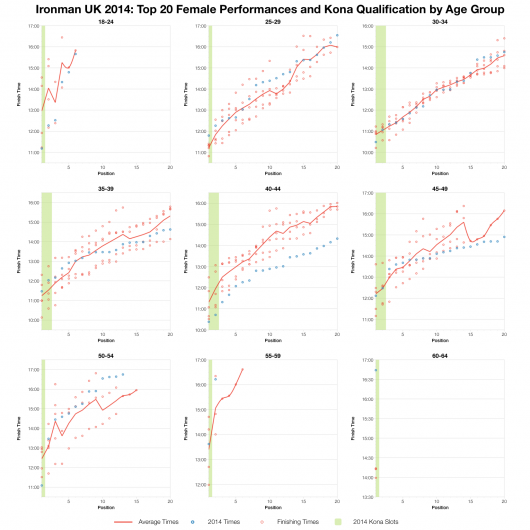 There’s a lot of variability in the age group performances this time round. It’s a mixed picture. My view is that this year was a somewhat slower year. Some of that may come from the course, although it doesn’t appear the new bike route deviates much from the old one. Some may have come from race day conditions, perhaps the run in particular was affected by this. 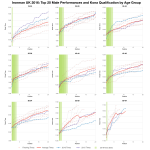 Given the variability among the top age groupers I also suspect the composition of the field played a roll. Overall a slower year largely due to a slower run. You can view a spreadsheet of the full results and splits for Ironman UK 2014 on my Google Drive.